Use romaine or other lettuce like you would use a taco shell, for crunchy texture use cabbage. 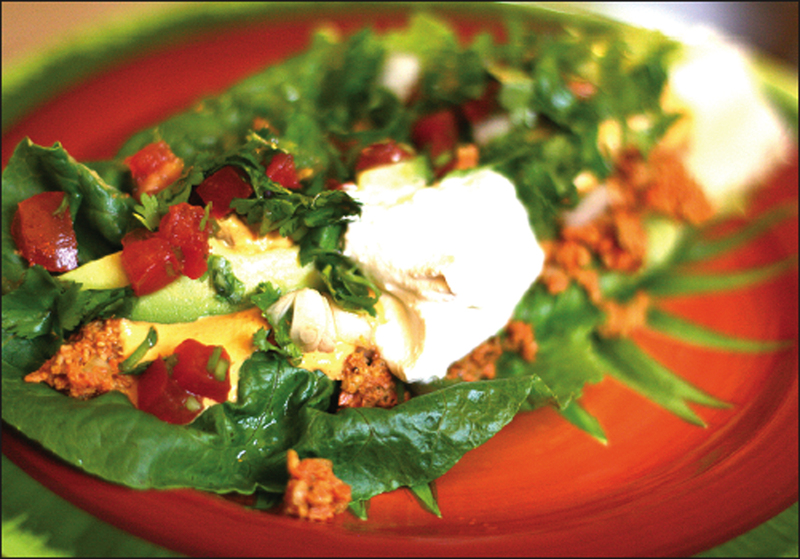 Then fill taco with walnut meat, avocado, pico de gallo, cashew cheese and sour cream. Feel free to add any other foods you like on tacos. Enjoy!!! -Make walnut meat in food processor, add carrots and beets first then walnuts, onion, garlic and spices. Mix until similar texture to taco meat. -Cut up 1 avocado into thin strips. -Chop ½ cilantro bunch and 1 onion, 2-3 tomatoes, and 1 jalapeno pepper without seeds (optional) to make pico de gallo for garnish. Add all ingredients to a food processor or high speed blender and add enough water to make consistency like sour cream. Add all ingredients to a food processor or high speed blender and add a little water (if too thick) or more nutritional yeast (if too watery) to make a nacho cheese consistency. Can use as topping or a dip for veggies or kale chips.